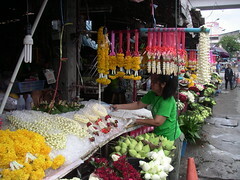 This vendor was selling prayer flowers. I saw these wreaths and flowers being carried around the Wats and being placed on shrines. Some of the larger shrines were literally buried with these wreaths.